There's a world out there beyond the keyboard. Let's participate in it! I admit that one of my favorite daily indulgences during the past fifteen or so years has been my daily (or twice or, when under duress, thrice daily) café latte. And until very recently that has meant a non-fat cow’s milk latte. But a few months ago, Suzanna and I became vegans (with the only exception being the occasional eating of wild seafood). So thus began my search for the perfect non-dairy plant-based “milk” to have with my latte. I’ve tried them all. Okay, not all but the following: soy, oat, hemp, almond, rice, coconut, and an almond-coconut mix. And for each, I have tried both the unsweetened and “original” or sweetened varieties. Coconut milk. This is my milk of choice when making my latte at home. I don’t use the kind you can buy in the carton, though, that will do in a pinch. I prefer to make my own. (See later in this post for my home-made recipe.) I have yet to find coconut milk served in a café, though. When out, and if available, rice milk. But the arsenic in rice, does concern me. Almond milk is another option when rice is not available. I have also tried making my own almond milk but soon after decided that I didn’t like almond milk that much after all. When no other option is available (like at Starbucks), soy milk. Secondly, at almost all espresso bars and cafes, they use way-too-sweet versions of the above milks. Apparently, the majority of the USA consuming world, likes their foods either too sweet, too salty, or too hoppy. And those with more moderate tastes are left to scramble to find something that they can tolerate. And it’s worth calling out Starbucks in particular: other than dairy milks, they only stock this ridiculously sweetened vanilla-soy milk that is barley drinkable. I just don’t understand why they can’t serve a less-sweetened variety and then let the sugar hawks add vanilla syrup and/or sweetener rather than push the overly-sweetened soy pap on all of us. This is why I prefer to make my own lattes at home where I have complete control over the “milk” selection process. Now, I did start out buying coconut milk that comes in the carton but I have two issues with that. First, it’s too sweet and second, there are two many ingredients. I prefer to get more elemental than that. Actually, not all of the coconut milks contain this last ingredient, guar gum (a paste made from the ground endosperm of guar beans), but after trying both those with and without guar gum, and after reading about guar gum, I have decided that I prefer the emulsifying and stabilizing qualities of the guar gum (which, by the way, is high in fiber and has been found to lower cholesterol) that makes the coconut milk retain a more even consistency. However, you may prefer to sacrifice a little emulsification for one less ingredient. Okay, enough chatter. Here is my recipe for coconut milk that works great in café lattes, and probably would work equally as well in other recipes requiring a milk substitute. 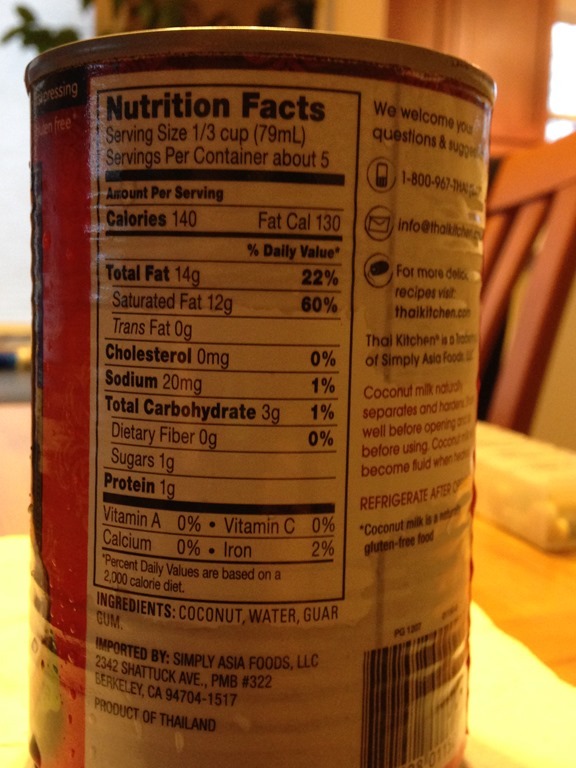 1 can (13-14 ounces) of Organic Coconut Milk. I have used coconut milk from the Thai Kitchen, Natural Value, and Whole Foods 365 Everyday Value brands. Don’t buy the the light version of coconut milk which is just a watered down version of the milk since you will be adding your own water. 2 teaspoons of Organic Sugar (or honey or some other sweetener). Note: most non-organic sugar from sugar cane is not vegan! 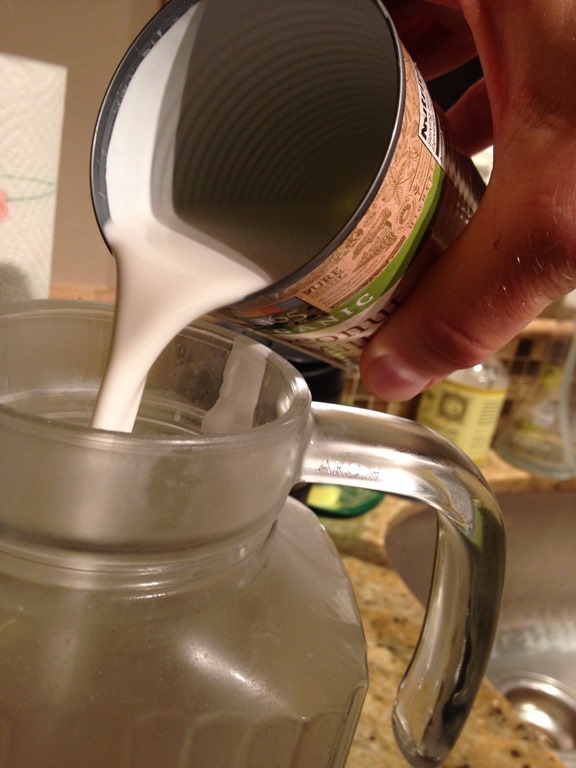 If using the coconut milk containing guar gum, pour the contents into a pitcher or container. If using the kind without guar gum, add the contents to a blender. You may need to use a knife, spoon, or some other utensil to scrape the coconut from the sides of the can and lid. Add two teaspoons of granulated sugar. 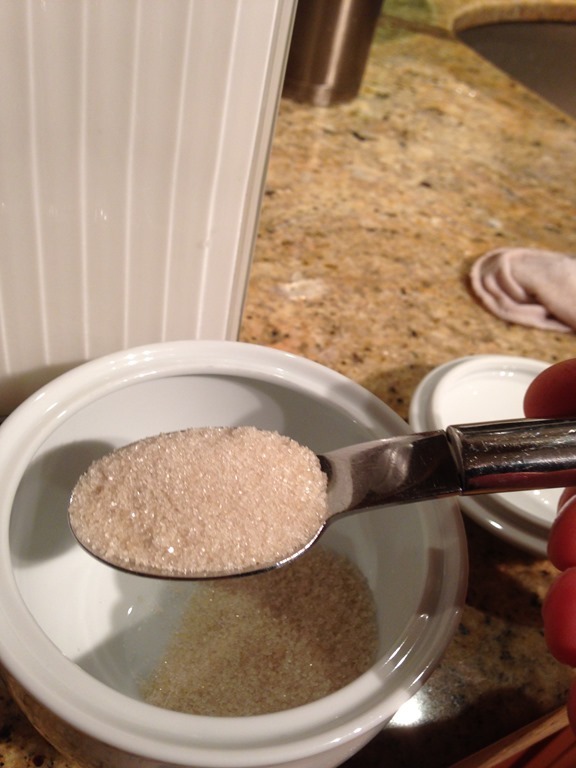 Two teaspoons works well for me, but you might wish to reduce or increase the amount of sugar to suit your taste buds. I’ve also made it with honey and, most recently, with organic coconut palm sugar. If using the variety of coconut milk containing guar gum (and thus, of a more even consistency), stir the mixture with a long wooden spoon; there is no need to use a blender. If using the variety without the guar gum, however, you will need to blend the mixture in the blender for about a minute. Store in the refrigerator for up to a week or so. The calories depends on the variety of milk and sweetener you use. 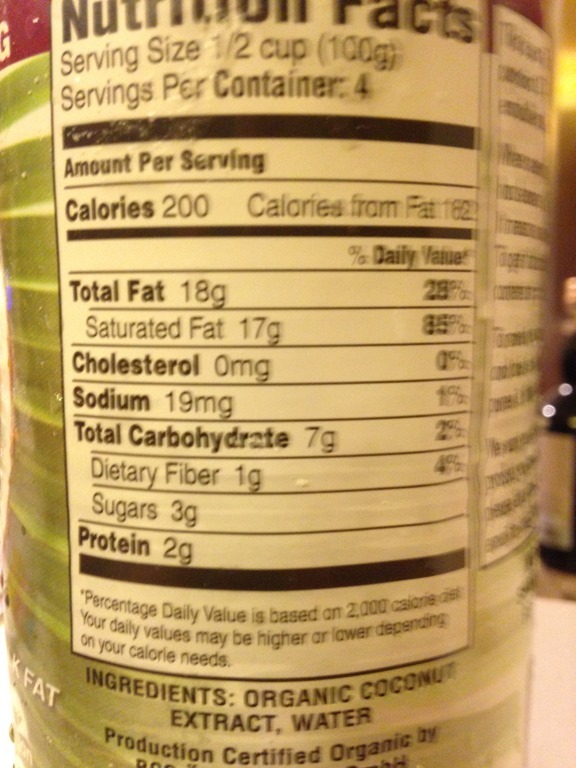 Also, I have always added 2 cans of water; you can certainly choose to add more water to the Natural Value brand of milk, for example, to reduce it’s caloric punch a bit. 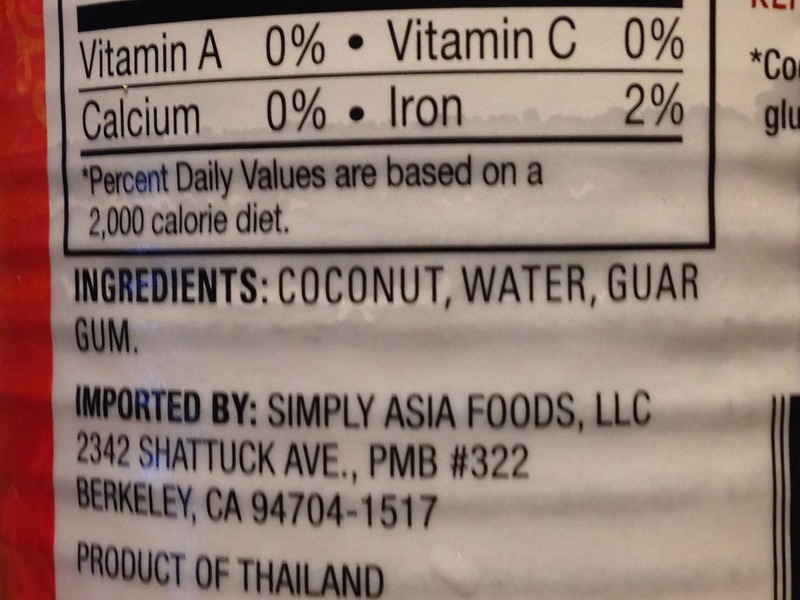 It’s also worth noting that most of the calories in coconut milk come from saturated (but plant-based) fat. The computed calorie counts are in the same ballpark as dairy milk and other non-diary milks. Coconut milk: 5 x 140 = 700 cal. Sugar: 2 x 16 = 32 cal. 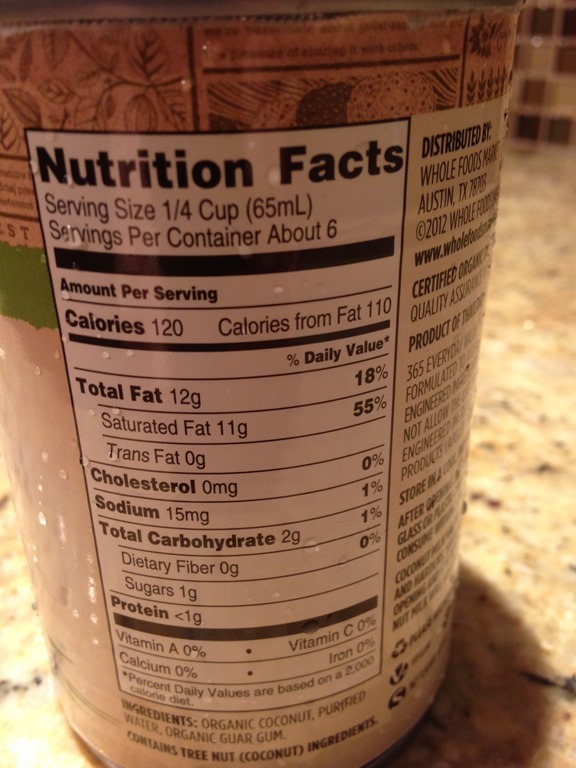 Total: 732 calories for 41 ounces or 17.9 calories per ounce. Or about 144 calories per cup. Coconut milk: 6 x 120 = 720 cal. Total: 752 calories for 40.5 ounces or 18.6 calories per ounce. Or about 147 calories per cup. Coconut milk: 4 x 200 = 800 cal. Total: 832 calories for 40.5 ounces or 20.5 calories per ounce. Or about 163 calories per cup. 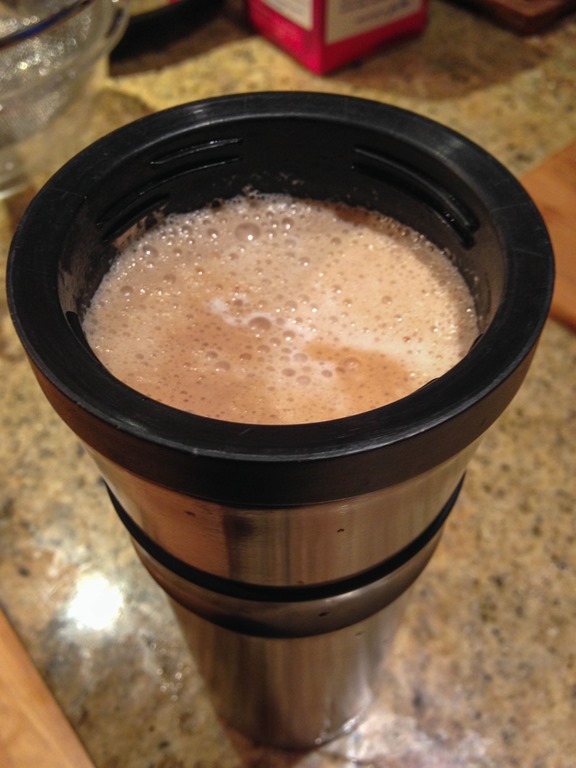 Since posting, I have changed my habits: now I have lattes made with Hemp Milk. We get the Pacific Original Hemp milk. I tried making my own hemp milk but that didn’t work so well. Pacific makes a very good hemp milk. On a couple of occasions, I have gotten very sour canned coconut milk that was almost undrinkable. In these cases, I have simply poured the whole concoction down the drain after tasting it. I’ve tried adding more sugar, but it didn’t help much. In the early 19th century in America, women couldn’t vote, slavery was legal, and blood-letting was a legitimate medical procedure. Around that time, scientists decided protein was the most important nutrient. We changed our thinking about the first three issues, but protein myths are still being perpetuated–and the meat, egg, and dairy industries want to keep the myths alive. We get all we need from plants. In developed nations, it’s hard to get too little protein. 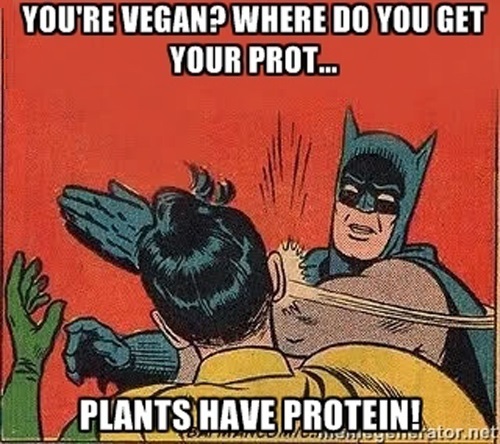 Too much protein is bad for our health.